This is a 16th century style Florentine which is not a sweet biscuit-type-thing or a spinach type thing... instead it is a fruity meat type-thing with an egg binder. The pastry has no water but is amazingly yolky. I have come to find that a yellow paste is far more desirable than a white or naturally golden-type that we are used to today. Brown, however, does not seem to be so desirable... the slight bubbled bit on top that turned brown should not be there, goes to show, as a cook, I did not watch my pie carefully enough. The family loved this pie! I tried it last night while warm and again this morning, cold. The paste remained dry and crisp the entire time... quite lovely! The pastry on the top left is a fairly short (fatty) version of a coffin and I find it works best cooked as an empty shell (to dry/harden) first. 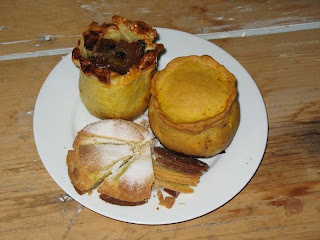 It is fairly tricky to work with as the pastry is not as stiff as a more inedible variety but if one were to make flat pies or raised pies with the help of some sort of form (such as a ring), they would work splendidly. The paste holds up well once baked but not as nicely as my non-egg past (as seen in a far earlier post), both are still quite edible. 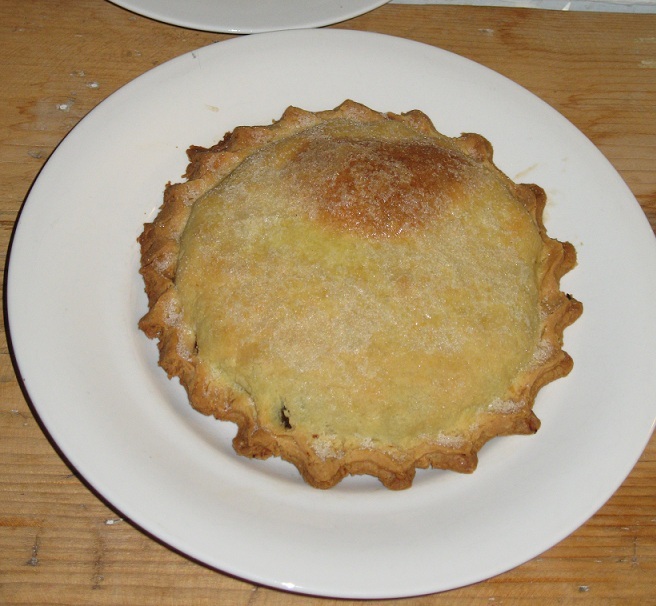 The pastry is washed with an egg yolk and as you can see, it over-browned a bit on the very top. This one was filled with a spicy fruit filling bound with egg... pastry was quite tasty! The pastry to the right is made from a much less tasty/edible past. Sure, you can still eat the pastry but it is really meant more as a cooking vessel. This one is coloured with a saffron wash (I added this after is cooked a bit, as you would with an egg wash... a wash is much cheaper than attempting to colour the entire past) which did not have any issues with turning too brown (yeah yeah, Scappi is right again!). The pastry was simply formed around a chunk of raw meat (basically described) and the meat cooked through... past held up wonderfully, it was super easy to work with and was basically no more than flour with fairly little fat and enough water to make pliable yet stiff. this was, by far, the more glutenous of the pasts which was perfect for the purpose! The bottom is simply a stacked pastry sprinkled with sugar. The past itself is the same stuff as was used for the Florentine and laid on a buttered plate with butter between each layer... though it really isn't special and nothing I'd likely serve (at least not on it's own), it shows the effects of over-browning where there is too much butter as well (the bottom would have seen the most butter). Common logic but still found it interesting to see the layers of browning from bottom to top.